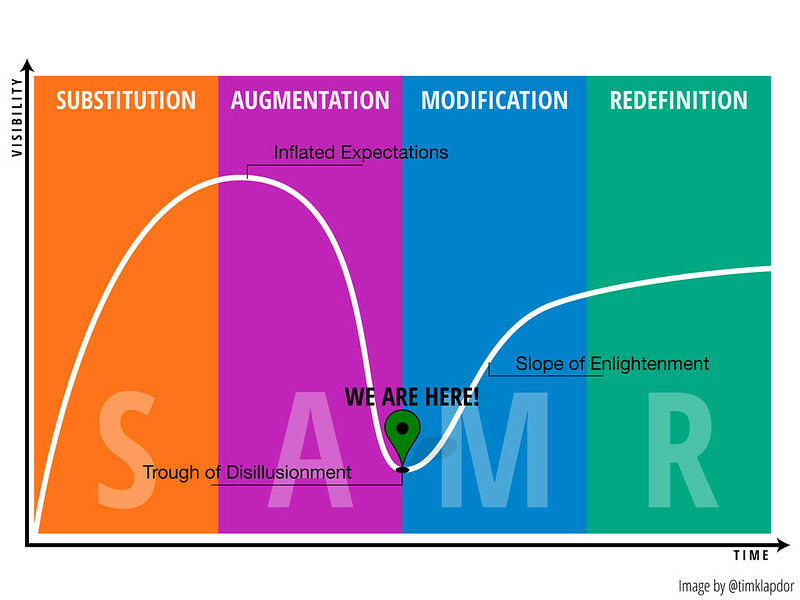 I wonder if one of the major problems is that vendors and the people that run organisations (and hence make decisions about educational technology) are best served by the substitution and augmentation phases of SAMR. For a vendor, they are likely to find it very difficult to find a market for a product that requires an organisation to modify or redefine how learning occurs. For an organisational manager modification and redefinition take too long to show outcomes and hence limits their ability to demonstrate progress by the 3rd year of their contract. It’s easier for vendors to sell and a manager to progress their career by engaging in replacement and augmentation. On another note, one of the problems I have with the Gartner hype cycle is that it assumes there will be a slope of enlightenment. I tend to think that for many educational technologies that never comes. Which is why I prefer van Dam’s 1999 never ending loop (because there’s always a new technology) or Birnbaum’s life cycle of fads. This would suggest a slightly different diagram with some sort of circular flow within the substitution and augmentation sections of SAMR and nothing in the modification and replacement sections. Tim, our little Twitter exchange prompted this additional comment. The big issue with EdTech at the moment is the lack of real solutions. The vendors and the products they are peddling are carry overs and do little more that enhance and keep the status quo. They don’t move very far down the SAMR line, and they barely get close to the real transformation that is possible (and needed). In short, I tend to belief that the modification and redefinition ends of SAMR require that the teacher/organisation that is organising the learning has to themselves engage in learning. It requires exploration, experimentation and learning to come up with something new that works within a specific context (this might be stretching things a bit). The trouble is most organisations adopt a process that is focused more on efficiency and consistency than it is on learning, innovation and diversity. Of course, that’s a hobby horse I’ve been riding for sometime. A great examination of EdTech. I am certainly looking forward to the reinvention of educational model! I think teachers will be empowered if given the opportunity and freedom to expand their classroom beyond it’s doors and use technology to enhance authentic learning. Thanks David. As always you pick up on some key points and I agree with your sentiments. There is a lack of disruption (hate to use such an over used word but it is the most appropriate) because for most involved their is no incentive. Managers won’t get promoted and vendors won’t make profit, and this mindset is driven I think because the main measure of success is dollars – not the student experience or even learning itself. The problem is the traditional thinking isn’t actually proven – particularly in the long term. I am going to throw Apple into the mix here – and maybe IKEA too – as companies that operate in a fundamentally different way, and as a result are hugely successful and profitable. And I think this is because they do a number of key things differently. 1. They create markets. Rather than find markets they create them by going to the other end of the SAMR scale. They modify and redefine to such an extent that they create something entirely new, and entice with it a whole new market. 2. People are Included in the Business. The reason why people return and keep spending money with IKEA and Apple is because they are treated as part of the business. Products are sold with the user embedded in the process. You put it together, you customise it, you do things with this product – it’s yours! We are yours! The product fits you rather than you fitting the product. Again their retail stores reflect the need to modify and redefine the typical customer experience. 3. Failure and Meritocracy. Both business have failure built into their process. IKEA rotate products, test them in different markets and the ones that don’t work fade away. Apple does this too – products inevitably fail. What happens (as your second comments covers) is that they learn from this – come back with something modify and redefined. To me Apple & IKEA are important because they don’t operate in the traditional “safe” way ie they dont just substitute or augment. They take risks, and as the years have gone by they have gotten better at it. The iPad is the perfect example of all this thinking coming together into a product line. Comparing it to Microsofts ‘traditional’ approach, sticking to the lower end of SAMR, you can see why they have failed to bring to market anything of any substance. I guess if there are managers or vendors out there reading this – my advice is that the biggest gains aren’t in the S&A loop you suggest David, but in the MR end. Thanks for pointing to those other models – I did relate – maybe too much! I suppose my way of thinking in regards to the “slope of enlightenment” is that at some point the technology becomes so sustainable and integrated that it tend to disappear. It becomes so engrained in our lives, like electricity and the car, that it’s no longer treated as technology, but simply it becomes just the way it’s done. I think I’ll jump on the hobby horse too as I think this is really key for institutions to understand. I presented at Ascilite on how I’ve tried to incorporate aspects of the Agile and Lean Startup approach to my work. The lean startups cyclical BUILD, MEASURE, LEARN process should be one that is at the heart of every institution. A culture of continuous improvement needs to become part of the way that institutions adapt to change, but also how we can create change of our own. It is interesting that we often neglect to let ourselves learn as institutions not just individuals, so its important in moving ahead that we create spaces and funding available for that process.